Tyler St. Jean is a yogi, traveler, soul sister and mother of a beautiful 4-year old, Vivienne. She grew up in Massachusetts and left there to embark on her own journey at the age of 18. Tyler traveled to New York where she studied education at the New School in NYC. Working with children and understanding how to communicate with them in healthy way is an incredible yoga practice. Tyler´s path has led her on a spiritual quest around the globe. She went to Costa Rica for an extended stay and later travelled around our own beautiful USA. Tyler´s journey eventually led her to New Orleans, Louisiana which she now calls home for herself and her family. Tyler has had a long-term relationship with the practice of yoga asana. 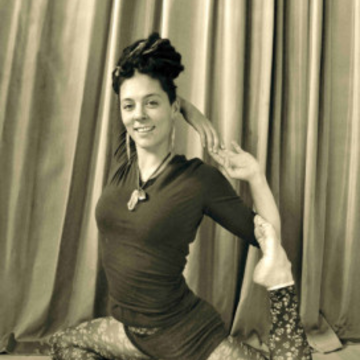 Originally a gymnast, she took her first yoga class at the young age of 15. As an adult living in New Orleans, Tyler completed her 350-hour teacher training with Michelle Baker at Swan River Yoga Shala and continues to participate in workshops to further her practice as both yoga student and teacher. Swan River is a practice based on both Jivamukti and Anusara styles. It is a vigorous flow practice that seamlessly infuses scripture references and spiritual guidance into the asana class. Tyler is an incredible teacher with lots of knowledge and lots of love to spread to her students.